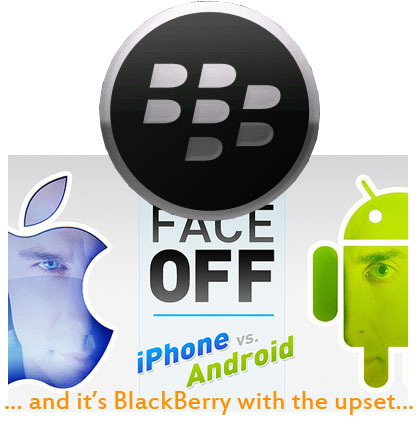 BlackBerry vs iPhone vs Android – it’s Klout Klobberin’ time! Klout is the standard of influence, as it itself suggests. If you don’t know about Klout, then Klout doesn’t know you.In a nutshell is a well-known one stop shop for measuring your online social influence. It “uses over 35 variables on Facebook and Twitter to measure True Reach, Amplification Probability and Network Score”. Klout recently pitted iPhone and Android against each other in a no holds barred Klout showdown. They compared the average Klout scores of both iPhone and Android influencers. After the smoke cleared, iPhone came out on top with a 42.0 to 40.6 win. So where does BlackBerry come into play? Klout was later asked to throw BlackBerry into the mix. From the onslaught rose a new champion…BlackBerry (in typical RIMPIRE Strikes Back fashion) emerged with a Klout score of 43.6!! I guess the real movers and shakers are BlackBerry users- don’t doubt the Klout.